Single parents have to develop a culture of accountability in their home once the separation or divorce has taken place. A “culture of accountability” position is one that says, “You are still accountable for your behavior here at home.” So no matter what else is going on outside the house or whatever feelings the child is having, including those that come from legitimate sources, the child is responsible for his or her behavior. I would say that being structured and clear after a divorce is much more helpful to kids than compromising your values because your children are going through a tough time. Remember, it’s during tough times that we need reliable structure the most. Limits, accountability, parental support, outside support when necessary—these are all part of a culture of accountability in the family. 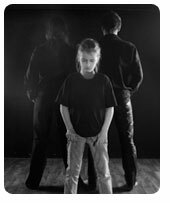 Kids experience a whole range of emotions when a separation and divorce occur. Remember that “divorce” and “separation” are legalistic terms. Once one parent moves out, the kids’ adverse emotional experience begins, no matter how it’s labeled. My opinion is that therapy should be flexible enough to involve everyone in various combinations, but still avoid involving sessions with both the parents and the children present unless absolutely necessary. Before those sessions, strict ground rules and agendas must be agreed upon by both parents. Remember, it is very likely the differences in perception, interpretation, and behaviors which led to the divorce in the first place could be acted out in the artificial situation. In some cases, kids will not want to participate in these types of therapeutic activities. In my experience, if kids are managing the divorce and the other areas of their life well, they should not be pushed to be involved. On the other hand, if they’re having behavioral or academic performance problems, behavior management therapy should be on the menu.